"C.J. Hite, Thanhouser Company president"
Thanhouser Company; Silent films; Hite, C.J. C.J. 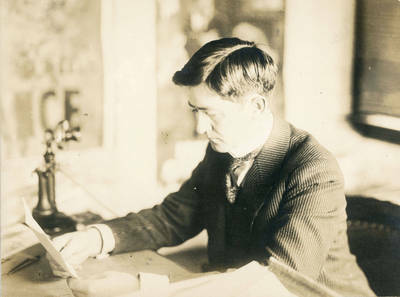 Hite, Thanhouser Company president, seated at his desk. He was president from Spring 1912 until his death August 1914. Photograph by Carl Louis Gregory. BW photograph; 6.25" x 8.25"